Means cutting sympathetic nerve or removing a sympathetic ganglion. The full name of ETS-C or ESB is Endoscopic Thoracic Sympathetic Block by clamping. It means interrupting sympathetic nervous conduction by clamping with a titanium clip and then therapeutic purpose is achieved. No cut of nervous trunk is performed on clamping method, for this sake, it possesses reversible potential by removal of the clip. Those methods does not provide for guaranteed complete reversal, but the methods gives a much greater opportunity for reversal. Means block 4th segment of Thoracic Sympathetic Ganglion to treat hand and armpit sweating problems. The specialty of ESB4 is which can treat hand or armpit sweating, effectively without inducing reflex sweating. In SP, or social phobia, depending on the more specific examination, left sided T2 to T4 treatment may be sufficient, in some cases the surgery has to be bilateral. of what is commonly called the autonomic nervous system. (Autonomic = can not be controlled by the mind). • The sympathetic nervous system has an active "pushing" function. • The parasympathetic has mainly a relaxing function. 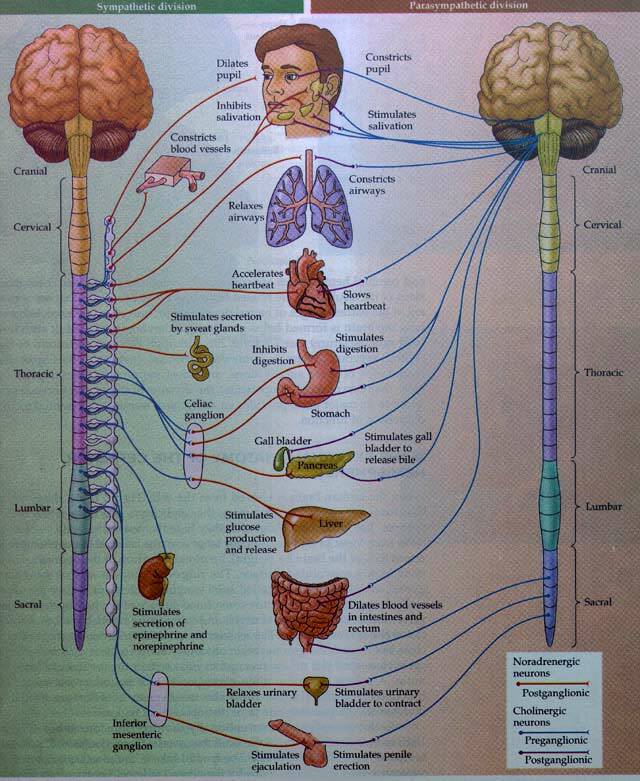 The sympathetic nervous system is located to the sympathetic chain, which connects to skin, blood vessels and organs in the body cavity. The sympathetic chain is located on both sides of the spine and consists of ganglia’s. The autonomic nervous system is most important in two situations: emergency situations that cause stress and require us to "fight" or take "flight", and no emergency situations that allow us to "rest" and "digest". When the body reacts to signals about e.g. danger it is the sympathetic ganglia that makes The lungs and the bronchial tubes are widened to give us more oxygen. The motility in the intestine is reduced - we shall not digest food - we must fight or run away! Blood is sent to the brain while skin and internal organs get less. Muscle tension is increased. Heart rate and force is increased. Below is a list of possible symptoms which you may or may not encounter. Each person reacts differently, so please do not believe that you will develop all the symptoms below. the commonly used ETS methods listed above. There are 2 problems here: Firstly, the small number of people who have died on the operating table. Whilst there is a risk in any surgery, ultimately this is an unnecessary surgery. There is an argument as to whether ETS should be done unilaterally (one side at a time), thus avoiding the risk of collapsing both lungs in the same operation. The tragic death of an Irishman on the operation table last year received a coroner's verdict of death by medical misadventure, and High Court action has been commenced. Secondly, death has followed ETS through consequent suicide due to side effects. Horribly, a young man in USA committed suicide in March 2003. Also around the world people have made multiple suicides and attempts, directly because of ETS side effects. Many patients find that after ETS they develop a flushing problem. There seems a lot of confusion as to why this happens, so all we can do is repeat some of the ideas which attempt to explain this. A distinction is drawn here between blushing, and flushing. Sympathectomy surgeon Telaranta describes blushing as a sympathetic mechanism, whilst flushing is a parasympathetic mechanism. One might wonder then whether removing sympathetic tone allows the parasympathetic system to take over, thus causing flushing. Another idea is that the sympathetic system is responsible for constricting the blood vessels, whilst the parasympathetic system allows for the opposite. Thus, removal of sympathetic tone allows too much parasympathetic stimuli, engendering vasodilatation, which manifests as redness on the face. This ties in with the reason for using ETS to treat Raynauds of the hands ~ to remove sympathetic tone, thus the blood vessels dilate, so that they get warmer. Telaranta is quoted as saying that dilation of blood vessels in the peripheries due to sympathectomy is a tool for treating Raynauds, but the same action does not happen in the face because the sympathetic system works differently there. A much simpler idea is that, where before ETS, flushing due to heat, hormones and emotion could be avoided through the natural cooling mechanism of perspiration from the head, the inability to release this heat causes flushing. (Johannes Zacherl, MDa, Martin Imhof, MDa, Erik R. Huber, MDa, Eugen G. Plas, MDa, Friedrich Herbst, MDa, Raimund Jakesz, MDa, Reinhold Függer, MDa) studied 558 patients and found 50.4% with Gustatory Sweating. Research Frey's Syndrome. Bradycardia is a recognized potential side effect of sympathectomy. Two American patients of surgeons who also operate in Britain advised that PET scans showed damage to the sympathetic nerves innervating the heart. One was told that he was somewhere between normal and pure autonomic failure. While it is not uncommon to complain of reduced exercise capacity, very few have complained of significant heart problems. This can be brought about by both ETS and nerve graft "reversal". The low incidence of Horner's through sympathectomy possibly explains why it is always included as a possible side effect by promoters of sympathectomy. The occasional unfortunate ancillary advice that this is a condition that can be remedied by a simple operation is perhaps a little misleading. The idea that post ETS hyperhidrosis is solely due to compensatory sweating is a nonsense. The total body perspiration experienced after ETS is greater than the total body perspiration before ETS. This extra amount has been described as "reflex sweating". No one fully understands it, but theories advanced attribute it to bad feedback from the build up of scar around nerves, or the break in communication between the brain and the lower body sweat glands. Even using the Surgeons' vocabulary, the nonsense statistics of reported compensatory sweating are now being replaced by more realistic figures, such as Gossot et al's 2001 publication about 940 patients, which advised an incidence of 100%. A 2003 publication by Gossot et al advised that compensatory hyperhidrosis did not improve with time. Long recognized to be a side effect of lumbar Sympathectomy (same nerve chain, though cut lower down the trunk), there has been a surprising reticence to acknowledge impotence due to thoracic Sympathectomy. The Radisson Group contains members with greatly reduced sexual strength which can not be attributed to psychological problems in the wake of ETS. Erec dys is a recognized symptom of autonomic dysfunction. (Indeed autonomic dysfunction also has symptoms of dizziness, bladder atone, dry eyes & mouth, and pupil abnormalities.) Sympathectomy is a massive trauma to the autonomic system. This seems to affect a relatively low percentage f people. Many of us now react abnormally to simple stimuli of sounds, light and touch. Whilst ETS is sometimes performed to combat social phobia, many of us now have far reduced tolerance to stress. 1) ETS is not a valid option for pain syndrome. 2) ETS can cause pain syndrome where there was none previously. A common observation amongst ETS patients. This is interesting in that it is another symptom shared by patients with thyroid problems, which are ultimately disturbances to the endocrine system. Incidence is low, an example of how we are all affected in so many different ways. This condition afflicts the peripheries, and is a touted reason for ETS. Many experienced warmer hands for some extended period after the operation, only for them to become sub normally cold afterwards. ETS corrupts peripheral blood flow and causes a condition similar to Raynaud's. ETS causes contra lateral vasoconstriction, leading to cold extremities in the areas of sympathetic denervation. Many of us found that our hands were warmer than normal after ETS, before they gradually went the opposite way, and become prone to being frighteningly cold. The interesting question here, is that this does not apply purely to the areas of sympathetic denervation (hands, fingers, ears etc), but can also affect the feet, which maintain sympathetic innervation's after ETS. This consequence of ETS is hailed as a positive by ETS surgeons. However, little connection is made between those patients who might benefit from a reduced pulse, and those patients which are admitted for ETS. Moreover, acceptance of the degree to which this is a problem is again disputed by ETS surgeons. Problems with nose and eyes can occur after ETS, including runny nose. This does not appear to be terribly common, but has been admitted by Gossot et al (Long-term results of Endoscopic Thoracic Sympathectomy for upper limb hyperhidrosis) as appearing in chronic form in 2.4% of their sample of 382 patients. Another study (Video assistance reduces complication rate of thoracoscopic sympathicotomy for hyperhidrosis (Johannes Zacherl, MDa, Martin Imhof, MDa, Erik R. Huber, MDa, Eugen G. Plas, MDa, Friedrich Herbst, MDa, Raimund Jakesz, MDa, Reinhold Függer, MDa) studied 558 patients and found 8.3% with Rhinitis. They refer to vasomotor rhinitis as "another symptom of a stellate ganglion lesion"
Lack of melanin, means reacting differently to sun. The skin is apparently the biggest organ in the body. Whilst the denervated top area may suffer from anhydrous and early aging due to ETS, the bottom half may be susceptible to sweat induced rashes in cleft areas, such as between the toes, or on the groin. Moreover, those who suffer permanent cold feelings may experience this all over the body, in both denervated and still innervated halves. The constant coldness suffered by some members might best be explained to those who thankfully do not suffer this, by reminding them of the feeling experienced with severe sunburn ~ the shivers, shakes and flushes. Interestingly, a praised side effect of ETS is that it can reduce acne, however, some have experienced very difficult skin conditions such as eczema. Some members also report a reduced ability to tan after ETS. it is pleasing to hear that some patients' post ETS complaint about dry skin have eased with time. Unfortunately, it is not only the extremities which are subject to cold sensitivity. For some of us, the whole body is subject to thermoregulatory problems. Whilst the peripheral coldness described in the Raynaud's Disease section can sometimes be akin to a frozen chicken feeling, this total body thermoregulation is less severe, and can be described more as a general feeling of being cold. Whereas the peripheral problem is largely influenced by external temperatures, this total body thermoregulatory problem can be evident regardless of temperature. Medical professionals using this site will not be surprised by this result of damage to the sympathetic system. It is well documented in other syndromes. This is not terribly common. Everyone talks about the dreaded CS (Compensatory sweating ) which almost 100% of the people will have after ETS, even the doctor's websites can't avoid mentioning it any more. But over and above the recognized side effects such as CS, fatigue or Horner’s (droopy eye), there are so many other smaller side effects that none of the websites mention, but which can make life much more uncomfortable, if not down right miserable. Here's a list of other side effects/discomforts. Not everyone is going to be affected by every side effect listed here, but enough of people have agreed that many of these things started happening only after having ETS. CS can get progressively worse and other problems can develop over time. but are described with slightly different words. When you read about what a complicated system the sympathetic chain is, you wonder how anyone can allow surgeons to perform ETS. If you are considering having ETS, I strongly recommend that you first try other remedies. However, I also understand that some people may feel surgery is the only option left. With that in mind, I've put together a suggested list of questions you should ask your doctor. Don't rush into surgery; take your time and do as much research as possible. If you have doubts, postpone your decision until you are completely sure that surgery is the only option left. Remember, this is surgery--it can not be fully reversed (this includes early removal of clamps). Even the most experienced ETS surgeon cannot guarantee good results. 1.) Consult at least two physicians that are familiar with the procedure but do not perform the procedure or have any financial interest in your decision. Try seeing one dermatologist and one neurologist. 2.) Bring a family member or close friend to the consultation. Having an objective third party present will prevent you from making an emotional decision regarding the surgery. 3.) Do not make your decision based solely on information gathered from surgeons websites, brochures and phone calls to the surgeons office. 4.) Do not schedule a consolation that can be followed by a surgery the same day. Go to a consultation and then spend at least a few weeks considering the risks. 5.) If you go alone to the consultation, bring a tape recorder to record the conversation. Tell the doctor you want to record the conversation. If he objects, then you have learned something about him. 6.) Realize that testimonials from happy post-op patients are anecdotal and do not reveal anything regarding the possibility that you will regret the surgery. 7.) Even though a minority of patients regret the surgery, regret is not at all rare. A five percent regret rate is 1 in 20 patients. A minority for sure, but it’s hardly a rare occurrence. Many studies demonstrate regret rates much higher over the long term.